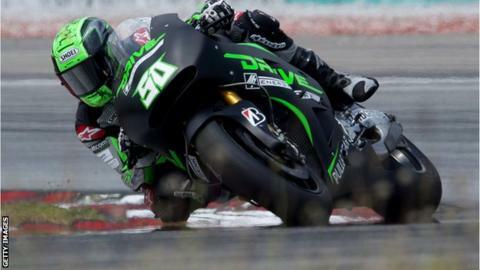 Northern Ireland man Eugene Laverty missed out on a points finish in the Indianapolis Moto GP event as he had to settle for 19th spot. The Aspar Honda rider from Toomebridge was three places behind his team-mate Nicky Hayden as Marc Marquez took victory ahead of Jorge Lorenzo. Valentino Rossi took the final podium spot to remain at the top of the World Championships standings. Laverty has picked up 12 points in his first MotoGP season. His best finish this season is a 12th spot in Spain. Rossi retains his lead in the world championship standings with a nine-point advantage over Yamaha team-mate Lorenzo. Counting 2011 and 2012 wins in the Moto2 category, Marquez has won five times in a row at the Indianapolis Motor Speedway. Sunday's victory made him the first three-time winner in the Indianapolis MotoGP.